Everything that you have stated is true about them.But like I said I just loved the way they were in the early sixties.I never get tired of listening to thier early music,and hearing those girls scream and seeing them jump up and down and just about pull thier hair out.Those were the days! Interesting comment relating to the Beatles, Drugs and "going off the deep end..."
We read these stories time and time again about our music celebrities of the 1960s and 1970s. I am more a "music fan/audiophile" than a purist/Beatles fan. For what my two cents is worth: These creative gents swam in the deep end through the 70s and found dry land again at the end of that popular decade. "Olympic-style swimmers" I say. I like Billboard Chart statistics more than I do biographical anecdotes. To be very honest with you all, I am more familiar with Mr. Elvis Presley's chart success than the Beatles. Beatles scholars you will kindly forgive me: let's see, put on my "Beatles-style" hair wig first: Mr. Star continued to record in the 70s and ventured into films, I am glad he still maintains his sense of humour. Mr. McCartney took the bull or should I say Ram by the horns (re: the LP cover on his first release as a successful solo artist), Mr. Lennon won his immigration battles, and joined that movement to "give peace a chance." This genius seemed unstoppable creatively until a genuine lunatic crossed his path, and we all know the rest of the story. Last but far from the least, Mr. Harrison suggested there is "something in the way she moves" and "all things must pass" as he was pictured (re: early 70s LP cover of a no less than very successful FOUR record set) sitting on the comode, but, there was nothing crappy about his record sales of that early 70s record lp set. He earned an "A+" in my books. Unfortunately, the "Big C" took him from us too early. I hope you enjoyed my little skip through the tulips of some music history. I wonder if Tiny Tim would approve? I hope I haven't offended too many here. Best wishes for every success to all in 2015! This eMuseum is e-Excellent! Cheers! They started off great.They had so many,many wonderful songs.Then,it 's sad to say,they went and got on drugs and went off the deep end. I'm just stateing the facts.Do the bookwork. Loved early music and saw their movies at the drive-in with my first boyfriend the summer after graduating from high school. The Beatles took Rock and Roll, and after giving it a ride, turn the recording industry upside down. And as Paul often said, there biggest influence went putting Sgt.Pepper Album together was Brian Wilson, the greatest producer and writer of music for this or any generation. I would also wonder what kind of record the Beatles and the Beach Boys would have made if they ever had the chance. Wow, the mind explodes with the thought. I saw them in person in Memphis in 1966, their last concert tour in the U.S. I was 13 and it was the most exciting thing in my life at the time! John wore granny glasses, couldn't see his eyes. It was one long scream from start to finish, got to hear alittle of what they were singing---i.e., "Please, please me", early songs. The next year they came out with Sgt. Pepper's. The Beatles are one of the few groups now or ever to bridge all the age gaps. They are as popular today as they were in the 60's. I agree with those prior. This is and always will be the best in music. If you really listen, notice how different each song is. Of all the songs written by them, there is only ONE I am not crazy about. Matter a fact, I guess you could say, "I don't like it." Anyone guess which song this might be? I would almost bet if you like the Beatles, you probably do not care for this one either.....The name is........"number 9." What's your opinion of this one? I was and still am a huge Beatles fan. I would just melt when Paul sang. I had a dream come true this past summer, as my daughter and grand son went to see Paul McCartney in concert. All three of us are fans, and he put on a fantastic show. Beatles forever! In my opinion, the greatest entertainers in history. Also greatest influence on too many areas to list. B-E-A-T-L-E-S, Beatles are the very best! Yay! My favorites boys! Thanks for adding them. What can I say? 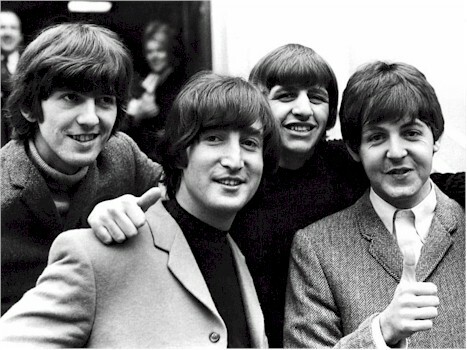 I was somehow oblivious to the rise of the Beatles, and first heard of them through the excitement of the girls in my 8th-grade class on the eve of the Fab Four's arrival in the U.S. and their appearance on The Ed Sullivan Show. In my defense, I must say that I became an instant fan and remain so.